Tero Saarinen’s movement language, with its influences from Asian dance traditions, collides with traditional Finnish music in MESH. 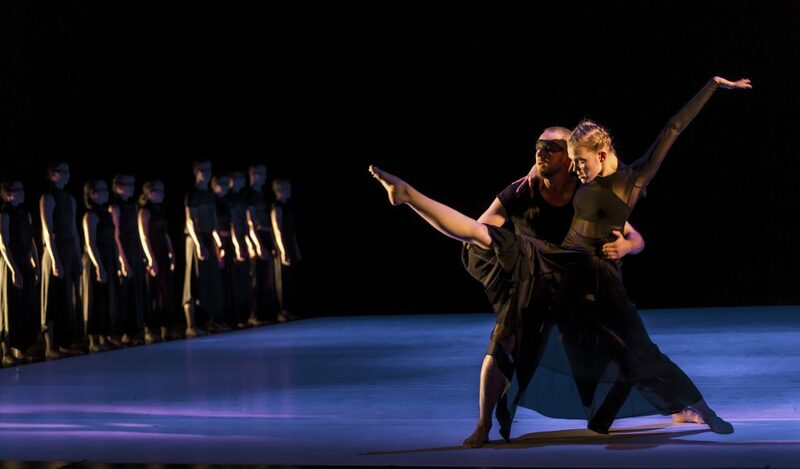 The creation, originally premiered by 20 Japanese dancers in 2014, explores themes such as communality and outsiderness. An intense interpretation by the Screaming Men’s Choir (Mieskuoro Huutajat) meets choreographer Saarinen’s vision of humanity and of our time, in which militant, nationalistic forces are raising their voices. The work entered TSC repertoire in 2016. The Company’s own strong contingent of soloists were joined on stage by Japanese Butoh dancer Mitsutake Kasai, and promising young talents from the Finnish National Ballet School and Youth Company, and the Theatre Academy of the University of the Arts Helsinki.